Bully Boy, Boston’s hometown small-batch distillery, is shaking—and stirring—things up. 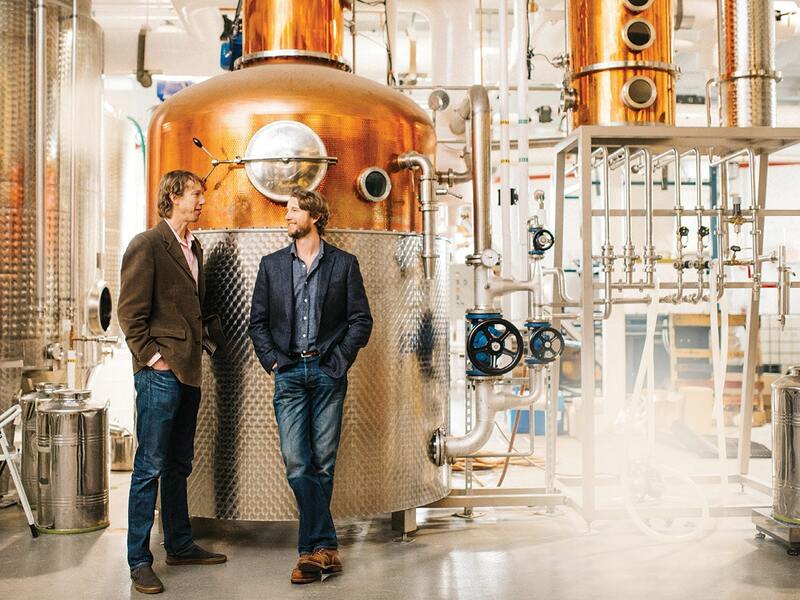 Founders Will and Dave Willis in Bully Boy’s new 8,000-squarefoot distillery. Perched above a swanky yet cozy room filled with leather seating and warm lighting in Boston’s Newmarket District is a mural depicting the great-grandfather of brothers Will and Dave Willis, riding his favorite farm workhorse, named Bully Boy. And the scene he hangs above? Well, that would be the newest endeavor of his two grandsons—a tasting room and distillery for their local line of spirits, which, by no coincidence whatsoever, also happens to be named Bully Boy. Those spirits—all made in small batches in the 750-gallon copper pot, get served up in the company’s “still to glass” cocktail program, by rotating specialty cocktails with housemade syrups and infusions. And if you’d rather just sip and savor the hard stuff straight, the staff offers spirit flights. There’s a gargantuan window at the bar with a bird’seye view of said still, as well as of the “laboratory” that holds 200-plus bottles of test spirits (made available only on-site) accessible by an adorably oldschool rolling library ladder. Character also oozes from the space for private events; dinner parties and tastings with head distiller Dave take place around its sprawling cedar chef’s table beneath chandeliers, framed by more than 100 wooden barrels of aging whiskeys and rums. As Will explains it, this was all the natural next step for the local brand. “We’ve always wanted to be Boston’s own hometown distillery,” he says. “We’re still a little bit of an insider’s secret that people who relish being in-theknow, know about. We’re not sold everywhere, which means the brand feels like a discovery for people.” So in that sense, you can consider the entire tasting room an extension of that feeling. “This personalizes the whole experience of drinking Bully Boy, and brings it home for people,” Will adds.